Have you ever been so disappointed by a company that you felt compelled to leave a negative review online? I remember one particularly bad restaurant experience where I had to confront the server several times about pieces of eggshells in my omelette – only to be brushed off each time. Even after complaining directly to the management, I didn’t get the attention or treatment that I felt I deserved. Naturally, I decided to leave the restaurant a negative online review as well as share my experience on social media. I did this to voice my disappointment to the public, but also as way to give the restaurant a last chance to turn the situation around. Unfortunately, they never responded – I still check for eggshells every time I have an omelette. According to marketing expert Jay Baer, when we’re criticized, “our instincts take over. We either pick a fight or turn the other cheek and pretend it didn’t happen, as a defense mechanism.” Some of us see criticism as an insult on our business or product and this is the reason we’re seeing more and more companies let negative reviews go unanswered. Many businesses think that ignoring negative online feedback is their best course of action. But this has changed, and we no longer live in a world where the brand is in control of what to communicate to its audience. Customers now have the ability to broadcast and amplify their negative sentiments with one click. Before the internet and social media, consumers had to handwrite letters or actually pick up a phone to make complaints. Nowadays, leaving a negative review online has become a reflex to instance of company dissatisfaction. After all, to voice your frustration to the world is just 140 characters away. Because of this, businesses need to not only respond to every negative review but they should try to leverage them. Here are 4 reasons why you should turn every negative feedback into an opportunity. Before the internet, customers had to reach out to the company by mail or telephone to complain. But regardless of how the situation was resolved, it was still discussed privately and stayed between the two parties. Now that the web has made everything available to everyone, whatever happens on the internet, stays on the internet. Online reviews are also not just limited to review sites such as Tripadvisor and Yelp anymore. They exist on almost every social media platform – making them incredibly easy to share. You know the saying, “there’s no such thing as bad publicity?” Unfortunately, this is no longer true in the age of digital transparency. According to business.com, 80 percent of consumers changed their minds before purchasing a product due to a bad review, costing businesses their reputation. For this reason, you should always respond to a frustrated customer. Back to my omelette dilemma. I vowed to never returned to that restaurant after they decided to ignore my negative review. For many of us, it can feel pretty personal when you never hear back from a business you made a complaint to. After all, you took the time to give them feedback, an acknowledgement is the least they can do. Responding to a bad review not only shows the one frustrated customer you care, it also shows everyone who is reading the review – especially your future customers. If you think that letting one bad review slide won’t do much to your reputation, think again. According to Vendasta, bad word of mouth nowadays “spreads faster than a wildfire.” We’re all oversharers, and one unattended negative review can set off a tweet-storm or slew of comments on your Facebook page. After all, how many people did I share my bad omelette experience with? Practically every person I know. No matter how hard you try as a business, you can’t be everything to everyone. And no matter how good your product or services is, it’s not going to live up to every person’s expectations. So while having a few negative reviews may add to your authenticity, you’ll want to make sure to respond to them accordingly so they don’t spread online. As I mentioned in the beginning of the post, I shared my negative experience of the restaurant on social media to give the business a last chance to turn the situation around. Every negative review is a chance for your company to explain your side of the story and change the customer’s opinion about your brand. Use it as a learning experience and embrace it as free feedback. When it comes down to it, negative reviews are inevitable for every business. So whether you’re a global B2B or an omelette shop, you can leverage bad reviews as a chance to show off your company’s authenticity, generosity and of course – your story. Not sure how to start managing your business’ bad reviews? 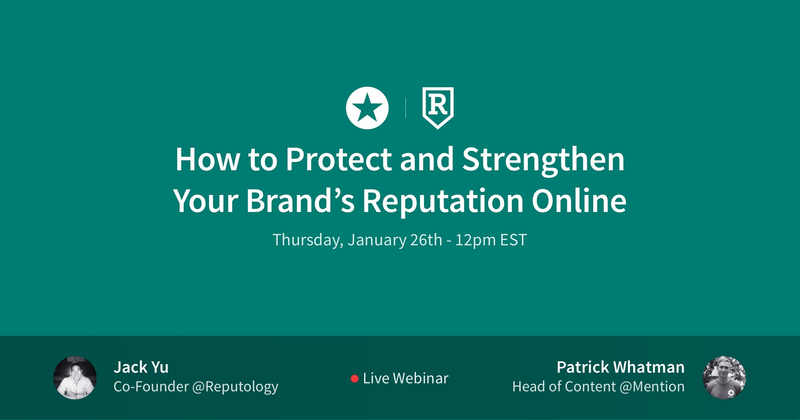 Check out our webinar with Reputology below.